The Port of Long Beach is an international gateway for the reliable, efficient and sustainable movement of goods for the benefit of our local and global economies. The Port of Long Beach is the premier U.S. gateway for trans-Pacific trade and a trailblazer in innovative goods movement, safety, environmental stewardship and sustainability. As the second-busiest container seaport in the United States, the Port handles trade valued at more than $194 billion annually and supports 1.5 million trade-related jobs across the nation, including 300,000 in Southern California. As the industry enters the “Big Ship Era,” the Port of Long Beach is one of the few U.S. ports that can welcome today’s largest vessels. Founded in 1911, the Port serves 175 shipping lines with connections to 217 seaports around the world. Goods moving through the Port reach every U.S. congressional district. The Port encompasses 3,200 acres with 31 miles of waterfront, 10 piers, 80 berths and 66 post-Panamax gantry cranes. In 2018, the Port handled more than 8 million container units and expects to see even more growth in 2019. 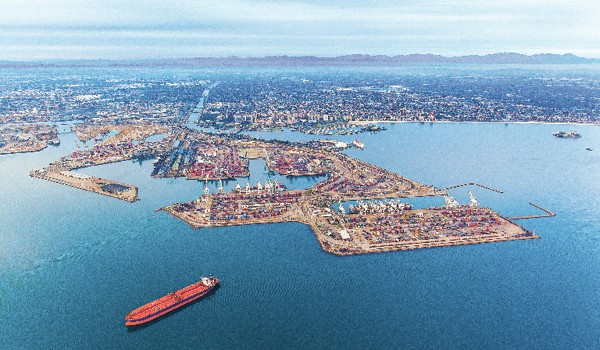 Led by the five-member Board of Harbor Commissioners and Executive Director Mario Cordero, the Port is investing $4 billion this decade in a capital improvement program, the largest in the nation. It is building some of the most modern, efficient and sustainable marine facilities in the world to accommodate bigger and bigger ships, while generating tens of thousands of new jobs in the region. The two largest projects are the replacement of the aging Gerald Desmond Bridge, budgeted at nearly $1.5 billion, and the Middle Harbor Terminal Redevelopment Project at $1.5 billion. Middle Harbor will be the most technologically advanced container terminal in North America, capable of moving more than three million container units annually while cutting air pollution by half from previous levels. The new landmark, cable-stayed bridge will be safer and provide better Port access than the current span. The Port of Long Beach prides itself on its culture of customer service and the strong relationships it maintains with industry, community, environmental advocates and partner agencies. It has received many accolades from government and industry for its landmark green initiatives, and industry leaders have named it “The Best Seaport in North America” in 19 of the past 23 years.